Woodworkers Source: How Much Does It Cost to Ship Lumber? To find out, we need to know what you want to have shipped and to where. We pass along the actual cost the carriers charge us. But we do get very good rates thanks to the volume of shipping we do. Add items to your cart then click "Estimate Shipping"
Some of our products include shipping or have a simple flat rate, which is clearly stated on the product's page. On other products, shipping charges are determined by UPS, USPS, or a truck freight carrier, depending on the size of the order in question. Go bulk! Shipments of 150 lbs or more get the absolute best rate-per-foot. You get more wood for your dollar than you do with smaller shipments. Shipping a quantity of 1 of any kind of wood, veneer, or plywood is very inefficient. Try adding a couple more pieces to your cart and then run the shipping estimator. You'll see that your shipping charge barely changes, yet you're getting more wood. What's The Longest Lumber You Can Ship? Most shipments go through UPS or FedEx. The longest lumber we can reasonably ship by ground services is 84". However, they do accept larger packages and they charge a very significant premium. Therefore, you can get 7' long lumber by UPS standard ground without excessive shipping fees. Shipping longer lengths is possible by LTL truck freight - see the next question. Can You Ship Long Lumber (8 feet or longer)? Yes. Long length lumber must be shipped by a truck freight carrier. First: the shipping rates aren't very economical unless you're shipping 150 lbs or more. That's about 60 board feet or so (depending on the wood). Second: truck freight delivery comes with a different level of service than you might be used to with is a UPS, FedEx, or USPS package delivery. Truck freight means someone at the delivery location must be available to unload the truck. We do what it takes to make this easier on you, though. 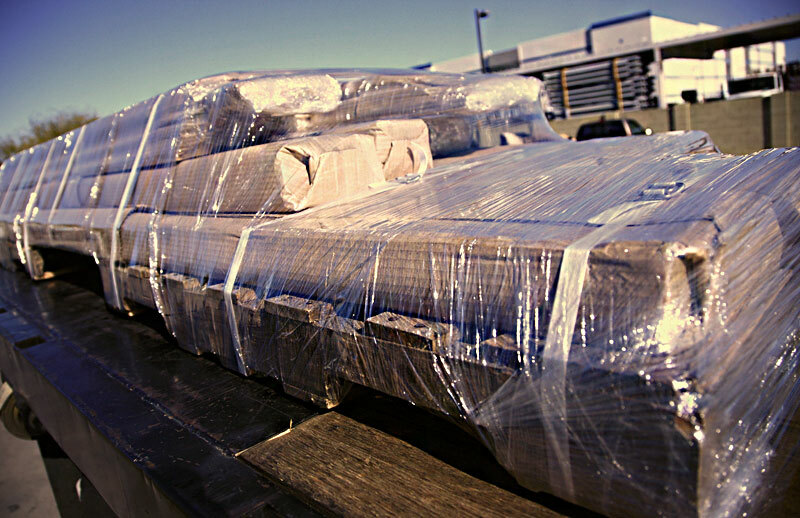 We'll wrap your lumber in smaller bundles you can manage by hand, then strap & wrap those to a pallet. That way you can clip the straps then unload one bundle at a time. Hardwood lumber shipped on a pallet to your home can be wrapped like this: wood wrapped in bundles approximately 60 to 70 lbs each, all strapped to a pallet and wrapped for protection. The individual bundles make it easier to unload by hand if you don't have a forklift to off-load the truck. Can I Have My Order Shipped Overseas? There are limitations on size. Usually the package may not exceed 36" in length. Please contact us to get a shipping quote. Because you're hiring someone to hand deliver heavy, awkward packages right to your door. The worst shipping rates occur between 1 to 5 lbs, and 71 to 79 lbs. We post the weight of your order right in the "View Basket" screen to help you make an informed decisions on how, if at all, you might want to adjust your order. Shipping small amounts, like just a couple of small pieces, is not usually economical. Shipping larger amounts of at least 150 lbs yields the best shipping rate. Size is another factor. Small package carriers like UPS, FedEx, and USPS charge extra fees on top of their weight rates for packages longer than 48" (and even more for packages longer than 96"). Sadly, a lot of furniture projects require length. If you can handle lengths shorter than 45", often we can get you a better shipping rate if you let us know. We charge you exactly what the carrier charges us. Shipping rates come directly from UPS, USPS, or a truck freight carrier (depending on the size of the shipment). Can I Get a Better Shipping Rate? Possibly. 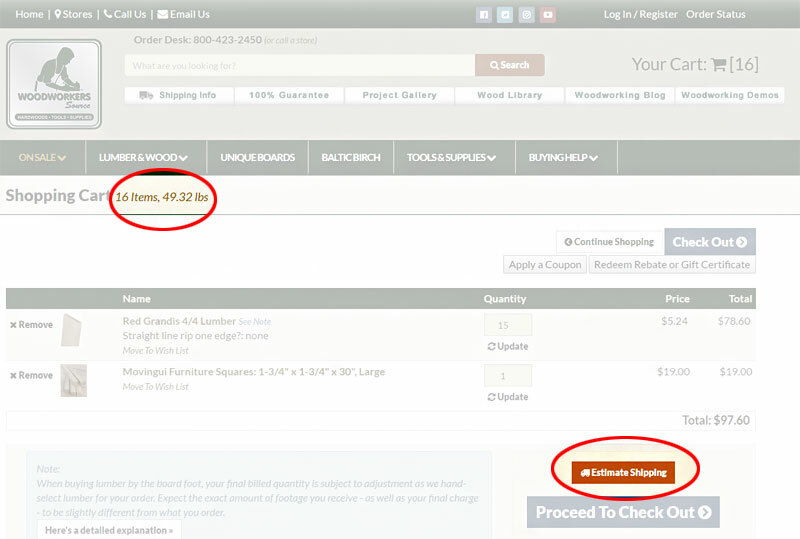 Take a look at the weight of your order in the "View Basket" screen. Now check the shipping charge. How do the two rates compare? The amount may have increased by a small amount, but you're getting more wood for your dollar. Shipping rates between 71 and 80 lbs are pretty steep. Increase your quantities to be closer to 150 lbs, or decrease quantities to be between 60 and 69 lbs. Call or e-mail us! We can often get a better rate for heavier orders like this by checking different shipping carriers, and we're happy to do it. It depends where you live. We ship from our beautiful warehouse in sunny Phoenix, Arizona. Check this map for a basic idea. Shipping charges are determined by the package sizes, weight, and destination of an order. We don't mark up the costs from U.S.P.S., UPS or truck freight carriers. To find out what it will cost to ship something to you, add items to your cart and click "Estimate Shipping"
Several of our products include the shipping costs within the 48 U.S., or have a simple flat rate. 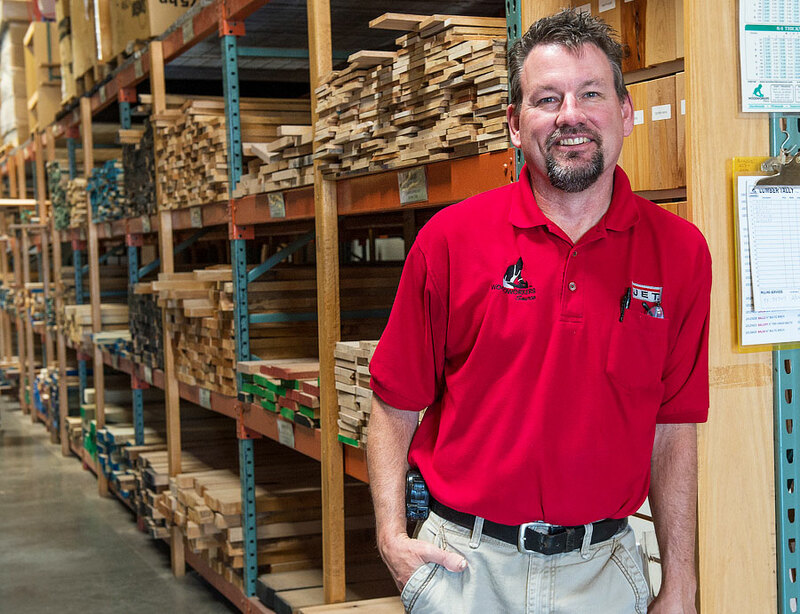 Picking out lumber requires more care & attention than other kinds of products - so it takes time. You'll find the weight of your order on the basket detail screen. We show you that to help you plan. We split lumber orders into more than one package when they're over 70 lbs. A package that's as close to 70 lbs without going over gets the best rate-per-pound. An order that goes over 70 lbs gets a better rate-per-pound as it gets closer to 150+ lbs than it does 71 lbs. Since wood is dense, heavy, and awkward, shipping a quantity of 1 or 2 (board feet, pieces, etc.) usually carries the highest shipping rate-per-pound. It's more economical to buy a medium quantity than it is to buy a small quantity of 1 or 2. To see for yourself, add a quantity of 1 to your cart and check the shipping estimate. Then, change your quantity to 4 or 5 and run the estimate again. You'll see the shipping charges only slightly change with a higher quantity of wood. The 70 lbs "magic" number mentioned before plays a role, too. If you go over 70 lbs, you'll get a better rate at (for example) 130 lbs than you will at 72 lbs. Canada shipments: most lumber and wood packages are shipped by UPS. Canadian customs and broker fees may apply at time of delivery. These costs are not included here, and are not under the control of Woodworkers Source nor UPS. Costs are charged by Canadian Customs and/or the broker.